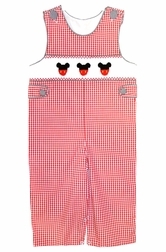 Here we have Banana Split's adorable red gingham longall for little boys who love Mickey Mouse or who are going to Disney for vacation. 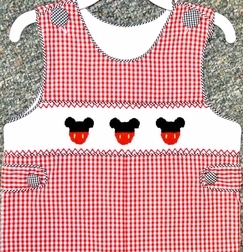 The longall is smocked across the chest with the smocking hand embroidered with 3 Mickey heads. The longall is accented with black gingham buttons and piping.